This will forever be the time of year that makes me miss Japan the most. Late October and all the way through December seemed to bring the most comfortable weather (for a Minnesotan, anyway) with clear blue skies and brilliantly colored leaves. For someone whose favorite season is fall, Tokyo was really the most amazing place to be. The Japanese Maples scattered about amongst shrines and in rare residential front and back yards became a fiery mix of red and orange and the gingko trees lining the streets were rich, vibrant yellow. I remember the gingko trees so clearly because they were especially bright the day we brought Riley home from the hospital in early December almost 2 years ago. We were sitting in a taxi, the driver was chatty but whispered so as not to wake the little person in the backseat, and I was gazing at the yellow leaves on the trees feeling free and terrified (mostly terrified) now that we were away from the hospital and my nurse call button. Bringing Riley home was scary, but that taxi ride was peaceful. Another reason I love fall is because it is finally cool enough to turn the oven on. Roasting vegetables, baking casseroles, and whipping up the occasional batch of cookies is something I look forward to all summer as I complain about the heat. I'm not a hot-weather bird. The difficult thing about this time of year is that most of what I want to cook is not all that healthy. So, I have to come up with dishes that satisfy my desire for comfort food but are also kind to my waistline. 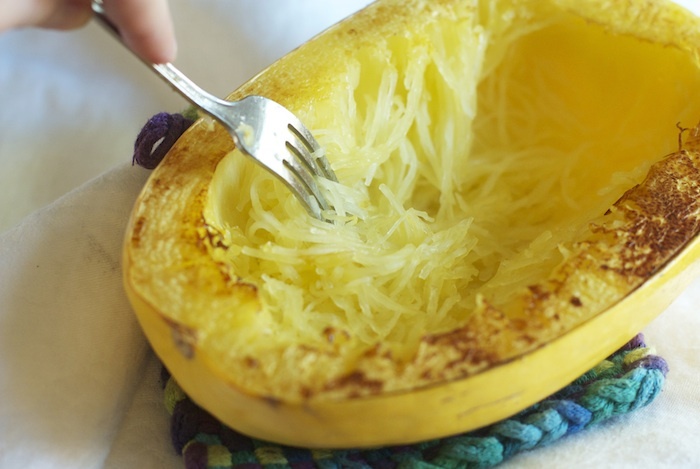 This spaghetti squash dish is perfect that way. It's full of flavor with a warm, cheesy topping that brings all the comfort I need. It's nearly a one pot meal and is largely hands-off, which is perfect for busy nights. If you're not into the chorizo idea, you can stir the squash with a little marinara or bolognese and top it with mozzarella instead of the Monterey Jack. You can also dress it up by adding some chopped kale, chard, spinach, sliced mushrooms- anything you want! There are a lot of possibilities with this dish so think about your favorite noodle recipe and see if you can adapt it to work here. Drizzle 1 tablespoon of the olive oil on a sheet pan. 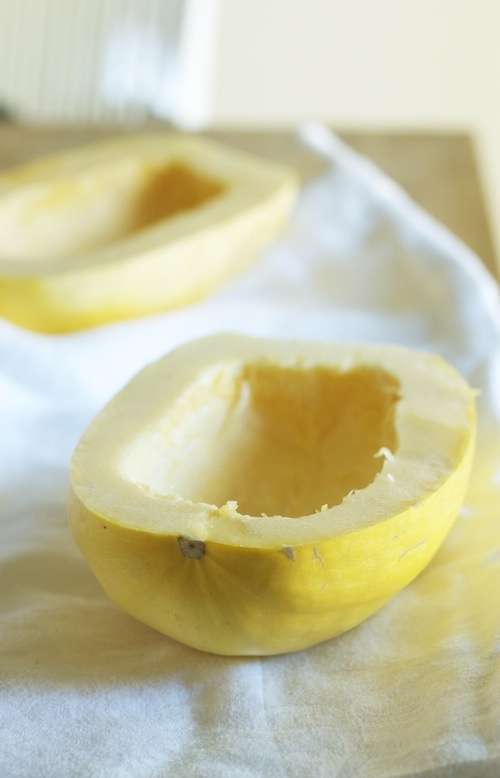 Cut the spaghetti squash in half lengthwise and scoop out the seeds and stringy stuff in the center. Place the squash halves cut side down on the oiled pan. Roast for 35-45 minutes or until the squash is tender and shredded easily. Meanwhile, in a large, heat proof skillet (cast iron works great), heat the remaining oil over medium heat. Add the onions and garlic and cook until just softened. Add the chorizo and stir to break it up and cook it through, about 2 or 3 minutes. Add the spaghetti squash and stir to combine it with the sausage mixture and to heat it through, about 1 minutes. Sprinkle the squash with the cheese and place it under the broiler in your oven until the cheese is golden and bubbly. 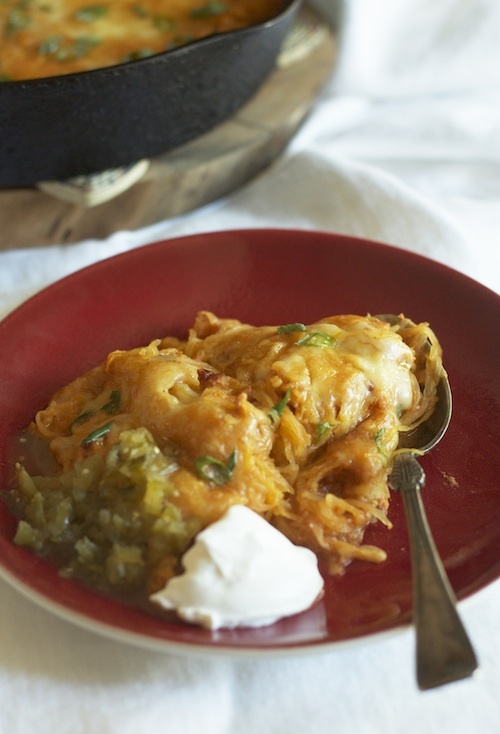 Serve this with sour cream and green chile salsa or any of your favorite Mexican food add-ons.